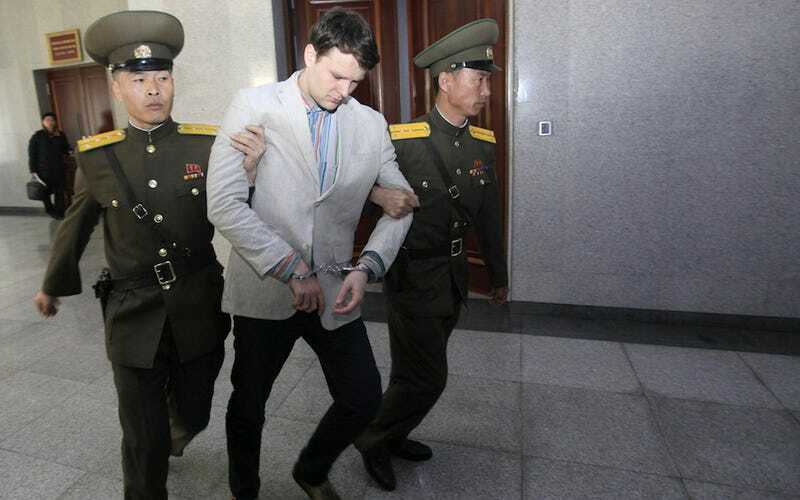 Otto Warmbier, a 21-year-old student at the University of Virginia who was visiting North Korea, has been given 15 years hard labor for crimes against the state after trying to steal a propaganda sign from a hotel. “I made the worst mistake of my life,” said Mr. Warmbier, sobbing and pleading for his release, according to Associated Press video of the news conference, which was held at the People’s Palace of Culture in Pyongyang. Early on Jan. 1, “I committed my crime of taking out the important political slogan from the staff-only area of the Yanggakdo International Hotel,” Mr. Warmbier, 21, said at the news conference. The charges against him said he was encouraged to commit the “hostile act” by a member of an Ohio church, a secretive university organization and the C.I.A. The BBC report points out that detainees of North Korea often recant these confessions when they get out of the country, which often doesn’t happen until senior U.S. officials or statesmen visit in person to secure their release. Warmbier was sentenced one day after US diplomat Bill Richardson met with officials to push for Warmbier’s release. North Korea has just been dealt crippling sanctions over a recent nuclear test, and BBC reports that the country sometimes detains foreigners as political leverage. According to the Times, a previous visitor was arrested and detained for months after leaving a bible in a hotel. According to the Washington Post, White House press secretary Josh Earnest said the U.S. government was working with the Swedish Embassy (the U.S. doesn’t have diplomatic relations with North Korea) on Warmbier’s case.